Yesterday’s temperature was the highest this year, they said. I’m having a couple of lazy days in Sussex, visiting my mum and grandparents. Lazy is the word, and it testifies to the heat. We spent yesterday lounging around in the garden, eating and drinking, with extreme indolence. A couple of trout on the barbeque–we saw to those at three-ish, and spent the rest of the day picking at salads, sipping on wine and smoking cigarettes. There was a crab salad with chilli, lemon and rocket. There was a tomato and basil salad and some bread to soak up the oily tomato juices. Later on in the day I made a salad with cucumber, melon, tomato, mint and goats cheese, with a good sour dressing. This is one of the most refreshing salads of all, and requires a baguette, and very cold, very dry white wine. We’d bought a bottle of Muscadet at Sainsbury’s earlier; it’s the kind of thing I pick up when it’s hot, because it’s cool, clear and mineral, and its alcohol is good and low. And Muscadet loves salads, and salads and hot days are good friends. It all adds up. Sainsbury’s Taste the Difference Muscadet is pretty decent, too. It’s Sevre et Maine sur lie–it’s been allowed to sit on dead yeast cells to extract their creamy sourness–and indeed it has good leesy character on the nose; as well as distinctly briney, wet flint qualities. It needs to be cold, though. Half an hour on the table, and a new glass starts to have a bit of a soggy armpit character. But I like good Muscadet, which this is. It’s appetizing and refreshing. The Muscadet grape, melon de bourgogne, produces crisp, neutral wines. In that respect it’s not unlike the vast quantity of Italian white wine, not least in that it goes splendidly with seafood. It is perhaps the best oyster wine. But while neautral Italian whites are very much aboutcrisp neutral fruit, tasting obscurely of undistinguished apples and unscented lemons, Muscadet has for me has the added attraction of salt, stones and yeast. It’s bracing; you feel the Atlantic spray in your face. You think of sunny mornings in French towns: dewy pavements and boulangeries, with their sweaty, bready twang. This is the trouble with hot days and the perfect wine for it; it’s so right I get lyrical. But there is something understated about Muscadet, too, that really gets to me, and makes me want to sing its praises. This is produced for Sainsbury’s by Domaine de la Fruitiere in Chateau Thebaud (see their charmingly lo-tech website), and shows how the supermarkets sometimes do very well in persuading good producers to stick different labels on their bottles. Sainsbury’s Taste the Difference Muscadet Sevre et Maine sur lie 2009 | £6.49 | 14.5, lovely. This is drinking superbly well. Getting on for ten years old, it’s showing signs of age in colour and taste. Deep ruby, with creeping brick, the nose has a centre of ripe bramble and strawberry framed with autumnal woodsiness and spice. There’s dried fruit, but it’s not confected. One of those wines that opens up, so that each nosing of it gives something apparently new. On the palate it’s sweet and ripe, full but not cloying, with a slightly over-ripe rusticity about it, which seems to me to speak of Southern France. It’s structured, but not so much so that you feel uptight around it. I like this wine a lot, but it is a bit weighty in terms of alcohol. Half a bottle of this, and you know it. Blend of syrah, grenache, carignan and cinsault. Made by Guy Vinlancker, who by all accounts is something of an eccentric. It is, above all, cheap at £11. Domaine la Combe Blanche 2001 “La Galine” Minervois | 14.5% abv | £11 | Extraordinarily good wine for the money, 16.5. This is a less expensive wine from Mas Cal Demoura, whose premium wine, “L’Infidele”, I like a lot. This is good too though: nice sweet ripe plum and cherry fruit, confected raspberry, rustic edges and herby notes. 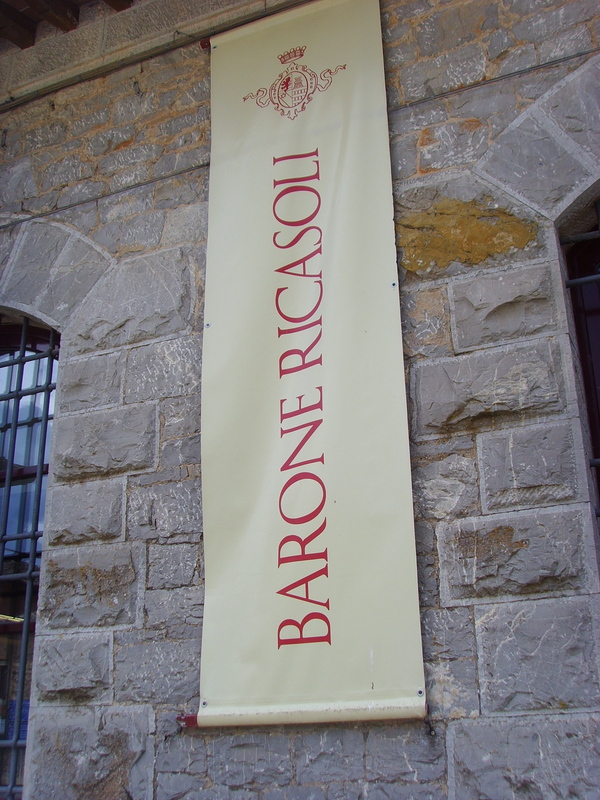 Arrived back yesterday from a trip to Barone Ricasoli in Chianti. A fabulous couple of days, and some brilliant wines (and food) which I’ll blog over the next couple of days. First a bit about the place itself. There is some serious PR going on here. Since the vineyard was reacquired by the Ricasoli family in the mid-90s a lot of necessary effort has gone into rebuilding the brand. Quality had slipped under previous management. The surface of the place is impressive. In the main refurbished building, there’s every corporate luxury going, a super-sleek conference centre, a dark wood and chrome Barone Ricasoli boutique shop with ten times more staff than customers, glass-walled mezzanine offices, brightly lit tasting rooms levitating above the vast entrance lobby, itself bedecked with beautiful and expensive furniture. The place is dripping with money; you feel not a corner has been cut. More importantly, though, the wine they’re making here is good. Massimiliano, the agronomist, picked us up from the company’s guesthouse in the morning on Wednesday and took us to each of the vineyard sites. The vineyards lie between 250 and 450m above sea level; some of the soils are dominated by clay, some are chalkier and stonier with better drainage, some aspects are north facing, while others face south – the more or less respectable grapes are planted accordingly. New plantings have been undertaken over the last 17 years. The majority of the vines are of course of Sangiovese, while the rest consist of Cabernet Sauvignon and Merlot, for blending into the top cru wine. There is also some Chardonnay and Sauvignon for the white, and Malvasia for the vin santo. The cru wine, Castello di Brolio, is a blend of grapes from two top vineyards. Colledilà (a beautiful south-west facing slope) and Casalferro (which is south-facing and contains a proportion of excellent Merlot) give their names to Ricasoli’s two supertuscans. Each lies at around 400m and has stony, clay-rich, chalky soil with good drainage. Stefano, the PR don, and the winemaker Marco took us round the winery. They showed us the host of fermentation tanks, stainless steel and temperature controlled, and talked about Sangiovese’s whimsy and co-operative Merlot. This is shiny, ultra-modern equipment, yet the place has a yeasty, boozy whiff about it that feels ingrained, as if in wood. They showed us the onsite laboratory with its whirring and spluttering machines and scientists decanting wines nonchalantly into test tubes. In the cellars they pointed out where, in the old days, there had been vast fibreglass tanks full of substandard wines for mass bottling. Now there are stacks upon stacks of new oak barriques, old oak barriques, splattered red, and new and old tonneaux – the 500l containers Marco favours for their gentle interaction with the fruit. Marco talks passionately about the origins of his barrels; the importance of inviting the coopers to taste his wine so that they can amend their barrels according to its peculiarities. In a designated section of the cellar, he fusses over experimental barrels chalked with the names of different coopers, different ages of barrel, names of forests and parcels of grapes. This is Marco’s garden shed, somewhere to rejoice in fiddling around with the minutiae of his obsessions: tastes, textures, blends and most of all terroir. Here he decants wine from the barrels into voluminous chianti glasses and we taste the 2010 Sangiovese that will go into the workhorse Chianti, Brolio, alongside that from Colledilà – for Castello di Brolio and the supertuscan varietal. The difference in concentration, texture and length is – already – remarkable. I don’t like to sound like shilling voice for Ricasoli, but I was really impressed by the care and passion of these people. I’m also just very grateful for an unfeasible succession of delicious meals and lovely wines. I’ll post some tasting notes tomorrow. Above: Massimiliano waved his hands in embarrassment at the state of these vines. Vineyard workers are pruning towards us on the opposite slope. Sometimes being in the wine industry you feel you’re learning not so much to know what to like, but what to sneer at. This week I was standing the kitchen at work holding a glass and saying how bored I am of this style of Marlborough sauv blanc, each one as extravagantly gooseberryish and nettly as the next. A colleague walked into the room, holding a glass, and said, Kiwi sauvignon is not my sort of wine at all: too primary, fruity and green. We are all as bad as each other. I know I have picked this opinion up from people I work with. But it’s flowed naturally into my drinking habits: I don’t really drink the stuff any more, and perhaps that’s a shame. There are just some wines we love (whimsically) to hate. Everybody thinks pinot grigio dull as ditchwater, and we sneer as people avoid all the wines with some actual character and reach for the chilled pg. We actively loathe the people who say they don’t like chardonnay. What, so you don’t like Meursault, Chablis or Champagne? But we still balk at overly oaky wines, and splutter about flabbiness, and that’s what people mean by “chardonnay”. We think that middle aged ladies who want something off-dry are hankering after blue nun, but we all think sugary Mosel rieslings electric, brilliant, tragically underrapreciated. People need to get over the idea that wine should be dry!